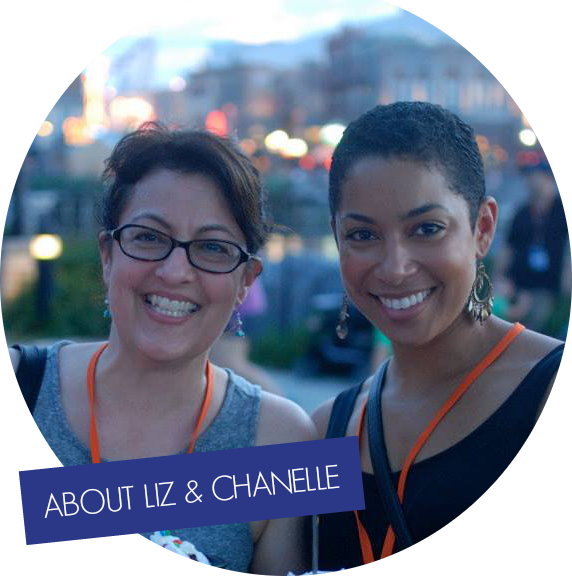 I participated in a campaign on behalf of Mom Central Consulting for Starburst. I received product samples to facilitate my review and a promotional item as a thank you for participating. Now that it’s Fall, it’s time to decorate the house for the holidays! First comes spooky stuff, then harvest colors and finally a month of the holly jolly, but slow down… I’m just starting level one. 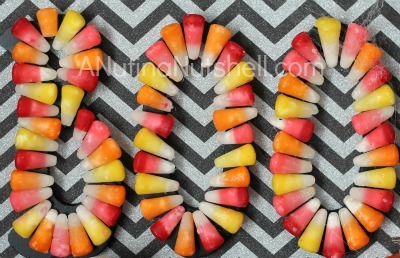 I was inspired to make a Halloween craft with Starburst Candy Corn, and the whole Starburst candy corn crafts idea comes from Tori Spelling, and everyone loves Tori Spelling! 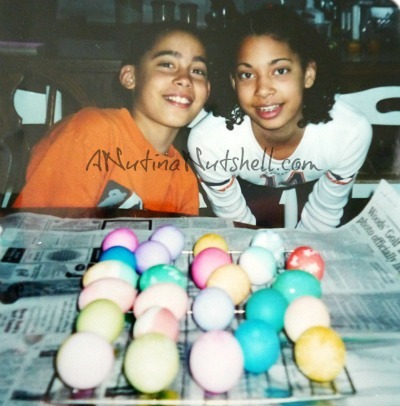 Seriously, the gal is a crafting whiz-bang. 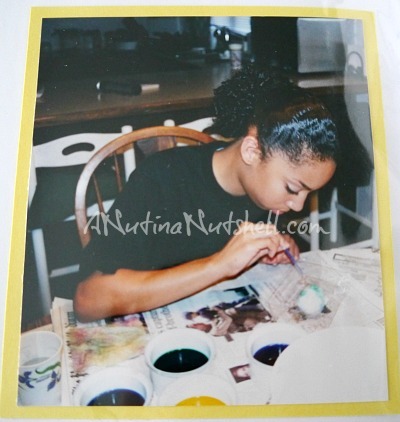 Look at her Fall candy craft projects! Wait, there’s more. She’s outta control with ideas! So I looked at her wonderful Halloween craft project ideas and decided to make something too: a Halloween mixed media collage of sorts. I don’t know what to call it! It’s a Halloween shadow box, I guess?? There’s no right and wrong with this craft, so just kinda go where you go with it. I’ll just tell you what I did and you take it from there. 🙂 Be simple, be elaborate, be whimsical, be terrifying… it’s completely up to you. 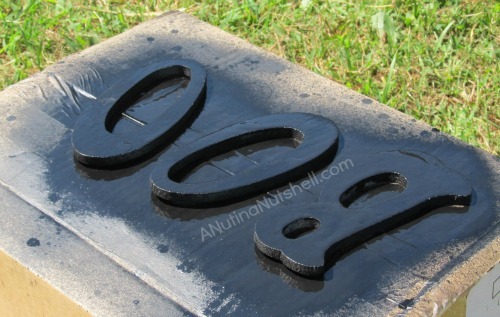 I sprayed the frame and the B-O-O letters with two coats of black spray paint and let them dry completely. 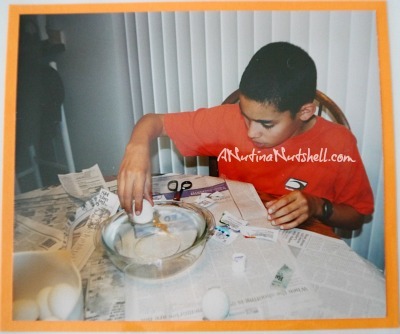 Then I took my sheet of heavyweight scrapbook paper and hot glued it to the center of the frame for a background. 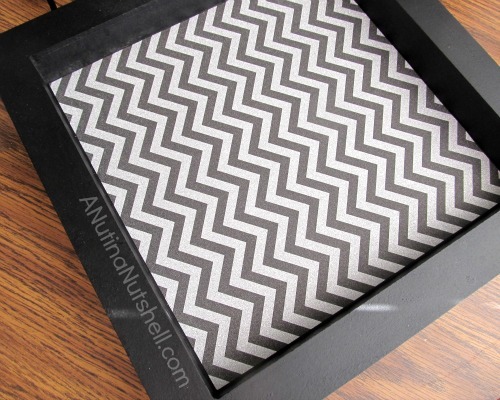 I fell in love with this pretty chevron-patterned paper the moment I saw it in the store. Candy time! 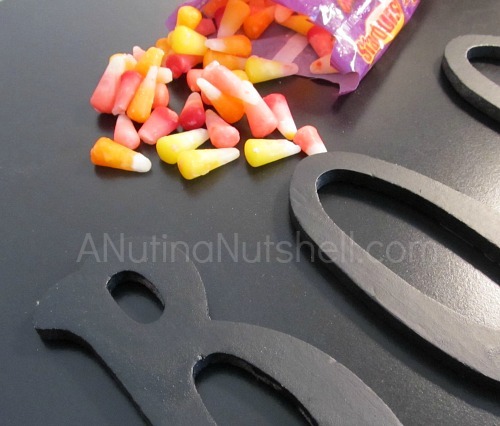 Hot glue the candy corn pieces onto the B-O-O letters in any way you’d like. I just glued whatever I grabbed. 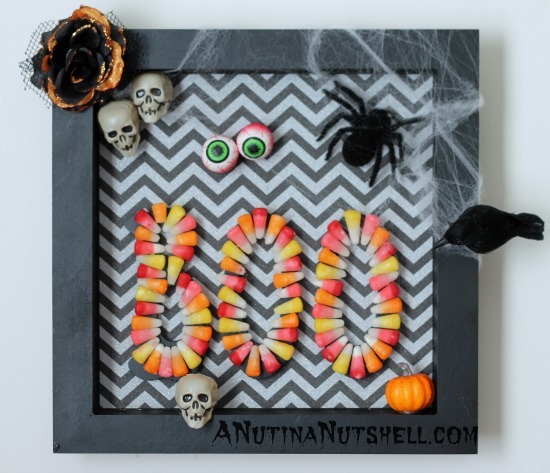 Then hot glue those letters onto your paper background. Don’t burn your fingers like I did, mmmkay? Now it’s time to be creative. 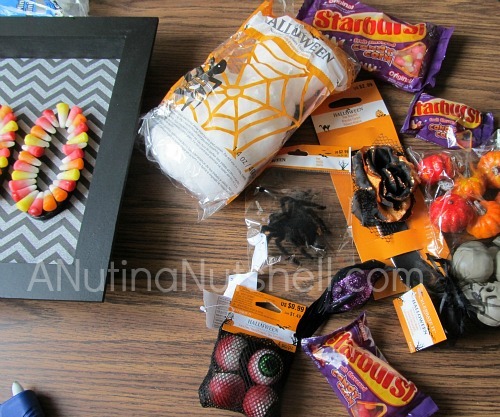 Use the hot glue to attach your Halloween embellishments any which-a-way you’d like in, on and around your shadow box display. I am so in love with this black crow I found. He attaches with a clip to the frame edge, so I can move his perching spot on a whim. 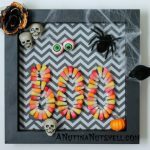 Hang your spooky shadow box on a wall and start the haunting! 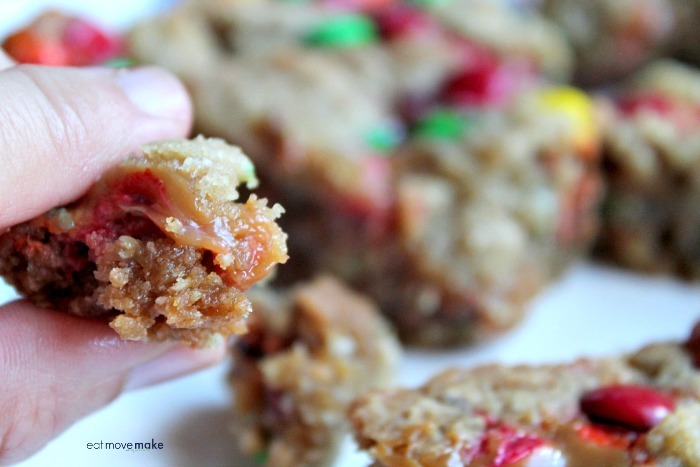 I kicked off Fall baking season with chocolate M&M’s and Mott’s apple juice in these Fall recipes as part of a sponsored post for Collective Bias®. I grew up with the “melt in your mouth, not in your hands” M&M’s philosophy. Eat ’em straight from the bag! 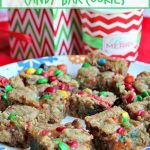 But when I spotted them in Fall colors at Walmart last week, I decided to add them to a Fall recipe and pop them in my mouth! So I did, and I did. 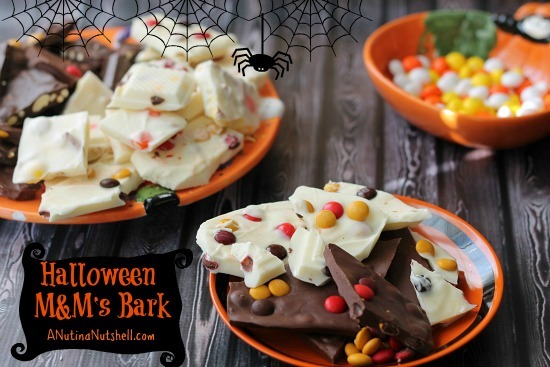 I made Halloween bark! 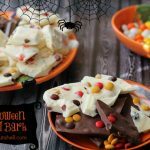 I used milk chocolate M&M’s and white chocolate candy corn M&M’s, and I also used both white and milk chocolate candy melts. 1. 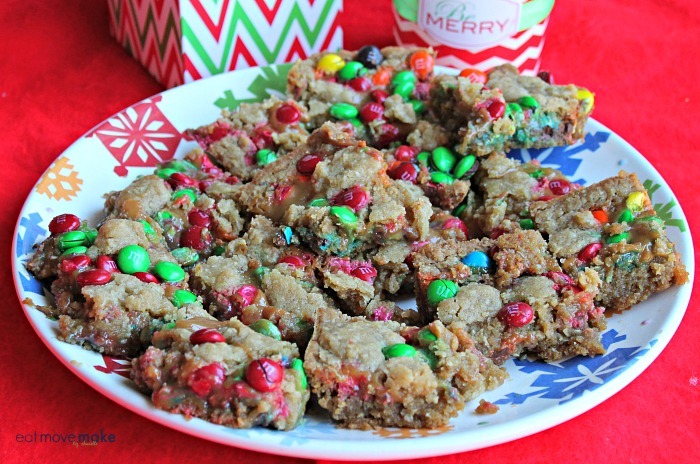 Heat chips or candy melt at 50% power in the microwave for about a minute to melt, stir until smooth and then mix in the M&M’s and pretzels. 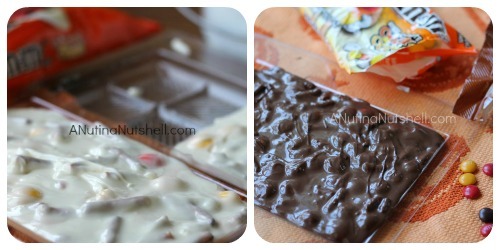 Pour that into candy bar molds and then refrigerate them for about 15 minutes. 2. 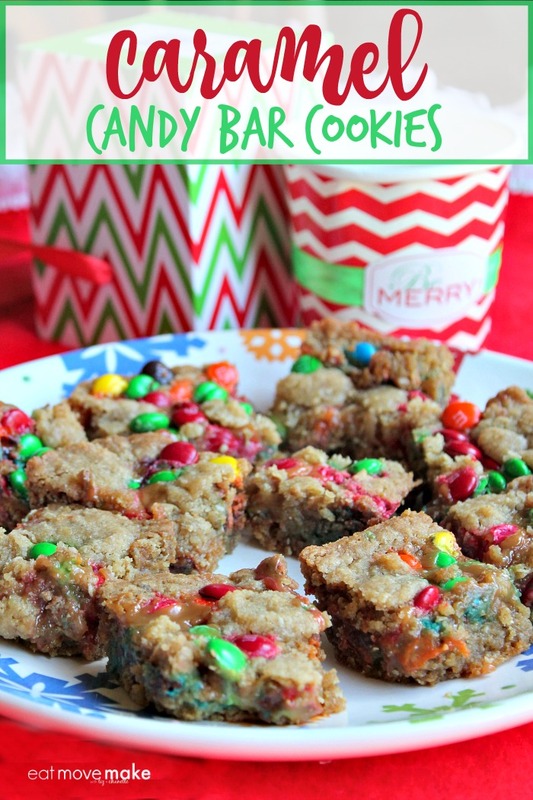 Remove from fridge and break into chunks. I kinda like breaking it into irregularly shaped pieces, but I’m not the boss of you. Note: You do not need molds for this! It works just as well and I actually like it best when I pour the mixture onto a waxed paper-covered cookie sheet and spread it to my desired thickness. 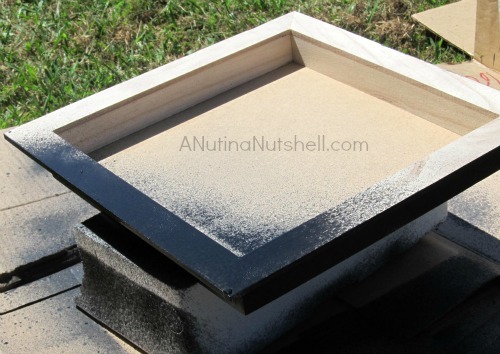 No need to spread to the edges or make it neat and square. Irregular bark pieces are more fun, I’m tellin’ ya. 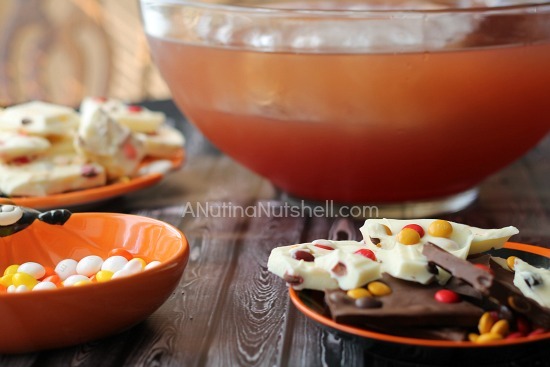 For kicks I made a quick apple juice punch with Mott’s Apple Juice to sip alongside. Sometimes I make a hot apple cider punch but the temps are way too hot here, so I chilled things up and went icy this time. Pour the all three juices into a punch bowl. Then gradually add a 2-liter bottle of ginger ale and stir together. Note: I made an ice ring to keep it cool by filling a gelatin mold with water and freezing it. 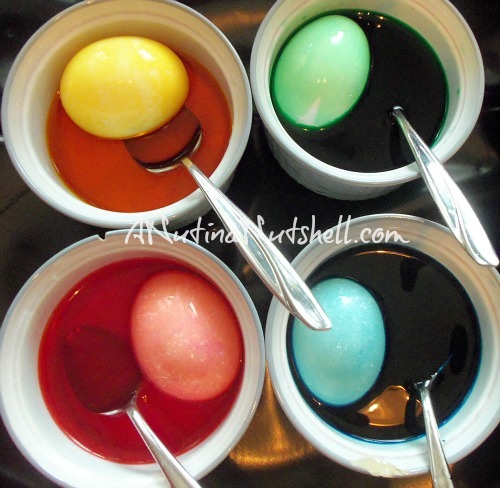 You can add citrus curls, pieces of fruit or anything you’d like to the freezing water to make it pretty. 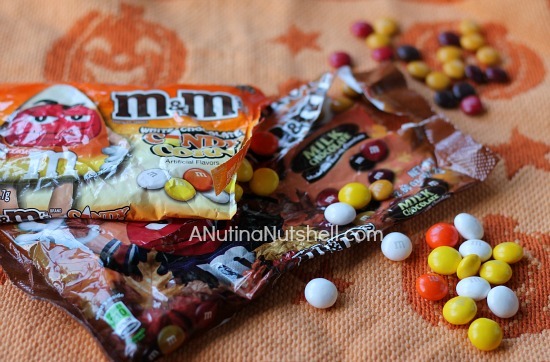 Like and follow M&M’s at Facebook.com/mms and @mmsgreen on Twitter. 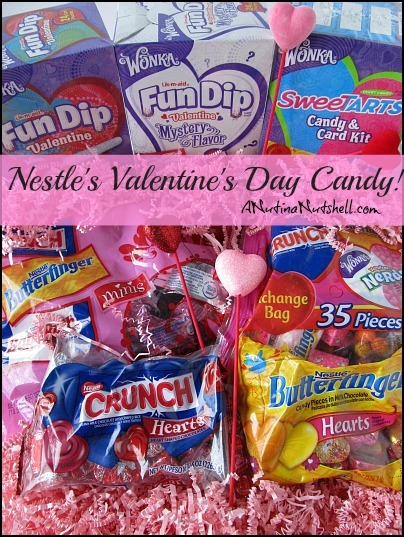 Sugar-free candy that tastes like regular candy! 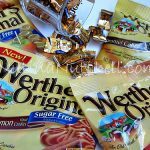 Werther’s Original Sugar Free candy is every bit as buttery, rich and delicious as the original candy that inspired it, and that simply doesn’t happen very often with any sugar free candy (or food for that matter). I kid you not when I tell you that other than the slightly smaller size, I can’t taste the difference. At all. Classic Werther’s Originals have 70 calories, 1.5 grams of fat, and 10 grams of sugar for three pieces of candy. 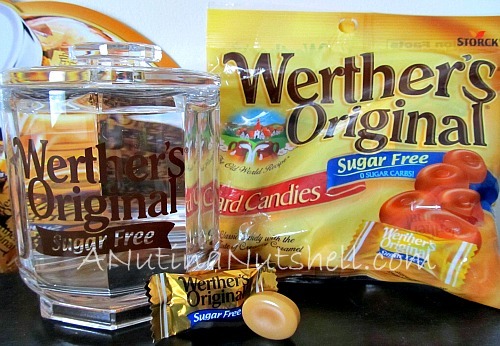 Werther’s Original Sugar Free candies have 40 calories, 1 to 1.5 grams of fat (based on the flavor variety), and absolutely NO SUGAR for five pieces of candy. 100% caramel satisfaction in an 8-calorie piece of sugar free candy — I call that a win! 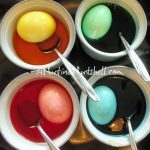 These delightful candies also come in several other flavor combinations like Caramel Apple, Caramel Coffee and Caramel Cinnamon. I haven’t tried the Caramel Coffee because I’m not a coffee person, but I did try the other two, and the Caramel Cinnamon won out for me. I wouldn’t have minded a little more cinnamon kick but the combination of the two totally worked! Delicious! I liked the Caramel Apple pretty well, but the flavor seemed a little artificial to me, so I liked the cinnamon better. 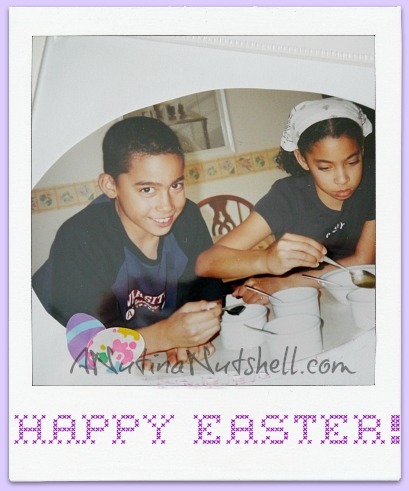 The original flavor with its smooth and creamy buttered caramel fabulousness will always be my favorite though! It’s crazy good, craaaaaaaaaaaaaaaaazy good. And that leads me to my next point and gentle warning: Too much of a good thing is never a good thing. I saw these words of wisdom printed right on the back of the bag, but I saw them too late. I had enjoyed entirely too many of the candies in one sitting, and I paid the price dearly. Dearly. Don’t do what I did. Pace yourselves. 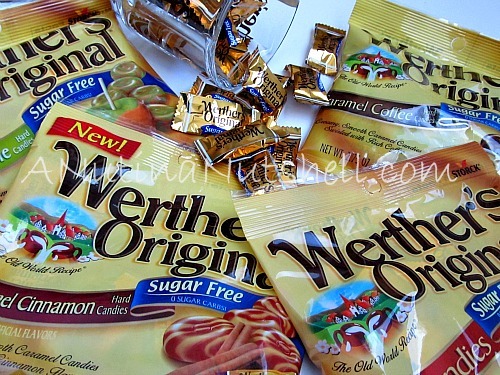 I’ve tried oodles of light, diet, and sugar free candy before, and none of them were as tasty and satisfying as regular candy, but I can honestly say that the Werther’s Original Sugar Free Candy hit the mark. 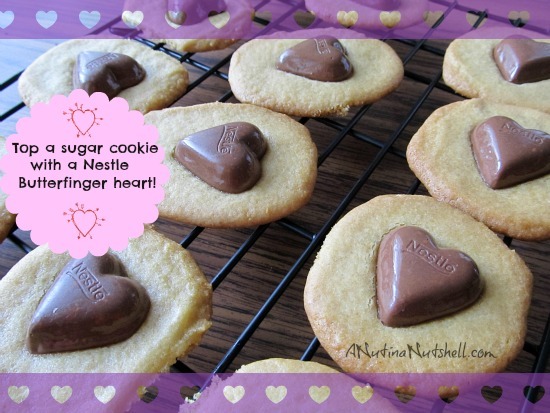 It’s nice to have a low calorie and sugar-free way to satisfy my sweet tooth without sacrificing taste! YUM! Which of the four Werther’s Original Sugar Free candy flavors would you like to try first: Original, Caramel Apple, Caramel Coffee or Caramel Cinnamon? 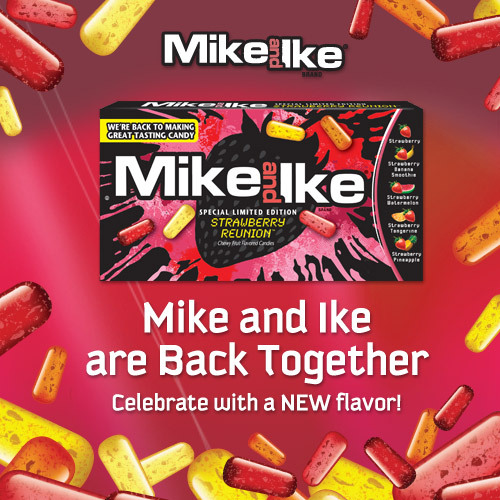 Mike and Ike Are Back Together! 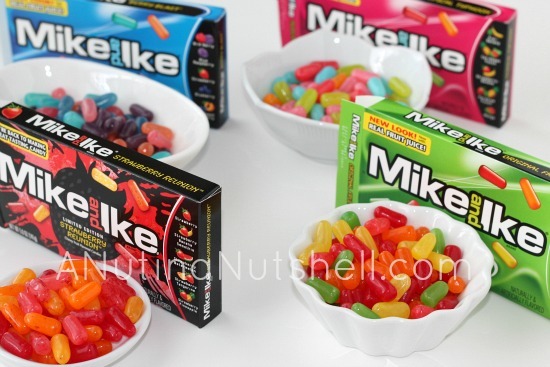 One of the biggest breakups in candy history happened when Mike and Ike split up last year, but I’m happy to say that Mike and Ike are back together again and better than ever! 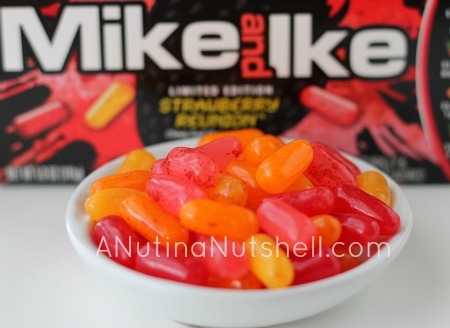 Now made with real fruit juice, Mike and Ike have a new and improved look and taste for all of their flavors, and they even have a brand new limited edition flavor at Walmart, Strawberry Reunion. The ‘reunion’ flavors are Strawberry Banana Smoothie, Strawberry Watermelon, Strawberry Tangerine and Strawberry Pineapple, and oh my gosh, they’re good! 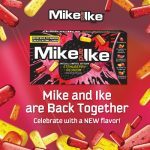 The Strawberry Reunion Mike and Ikes join the Original, Berry Blast, Sour Fruitz and Tropical Typhoon flavors, also on the shelves of Walmart. I had to try each and every flavor to figure out which one speaks the most nom nom nom to me, and I think it’s the Tropical Typhoon because there are two banana combinations in that box – kiwi banana and strawberry banana. Make your #whatsyourflavor votes right here! 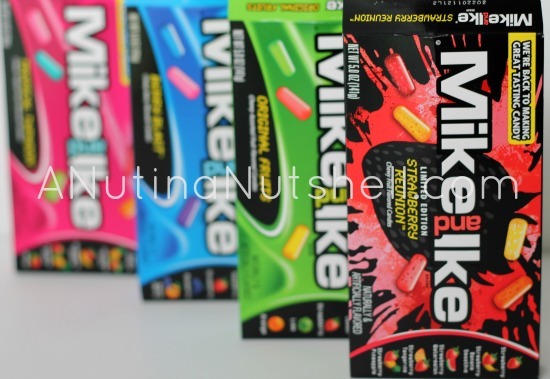 One lucky reader will win a $50 Walmart gift card so they can go try all the new Mike and Ike flavors too! This post is sponsored by Lunchbox. 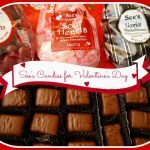 All opinions are my own..
See’s Candies for Valentine’s Day! Deciding what to order from See’s Candies is so hard! There are over 100 items to choose from, and they all look sinfully delicious. 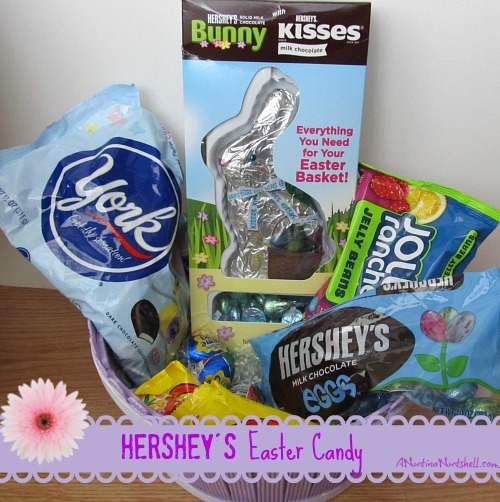 But I finally decided to get some chocolate and some candy. Winning decision, oui? I must have milk chocolate and caramel together. Must.Have.It. Milk Butterchews, Milk Butterchews, Milk Butterchews. I practically cry the words out in my sleep now, because oh how they satisfy. Perfectly sweetened milk chocolate surrounds a rich, buttery and chewy caramel (and I’m typing this with my eyes closed so I can relive it). Yes, people, they’re that good. 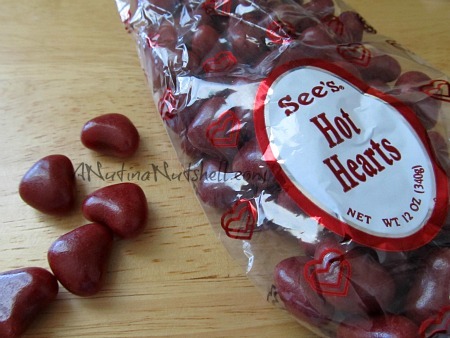 As you know, I’m also a huge cinnamon fan so I couldn’t resist trying the Hot Hearts ($5.40).They’re cinnamon jellies with a candy shell coating, and they contain the perfect amount of heat. I’d say it’s the best cinnamon spice level that I’ve ever tasted in a candy. It teases you with the heat, but never goes too far. I guess everyone else loves them too, because they’re sold out! 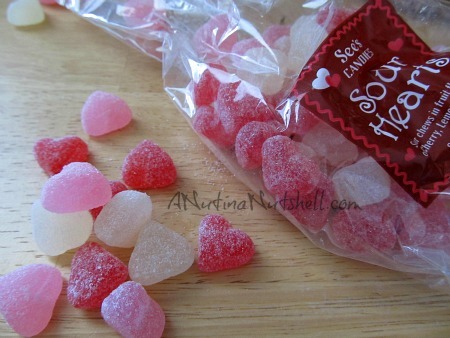 I’m also a giant fan of the sour/sweet candy combo, so I ordered a bag of cherry, lemon and berry flavored Sour Hearts ($5.70). 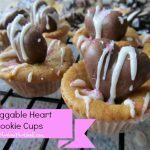 They’re jelly hearts that tickle the tongue with a mildly tart and tangy sugar coating, and then delight it with the perfect amount of sweetness. 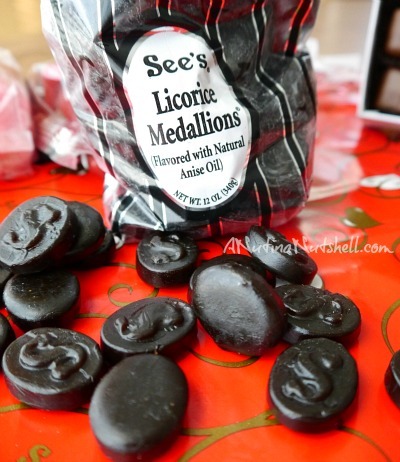 Last but not least, I picked out these Licorice Medallions ($4.80) for the boyfriend (who would probably stuff ten of them at a time in his mouth if he could). He loves these! They’re soft, chewy and have a rich, delicious anise flavor. Visit Sees.com for this kind of yummy goodness and more! 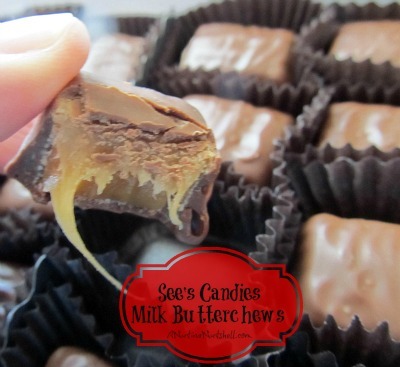 By the way, the Milk Butterchews are $21.70 for a 1-pound box. 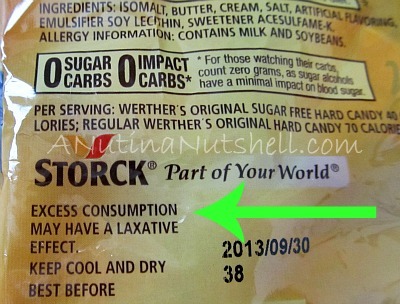 Oh, and in case you didn’t know, See’s Candies have zero added preservatives in them. None, nada, zilch. Love that. 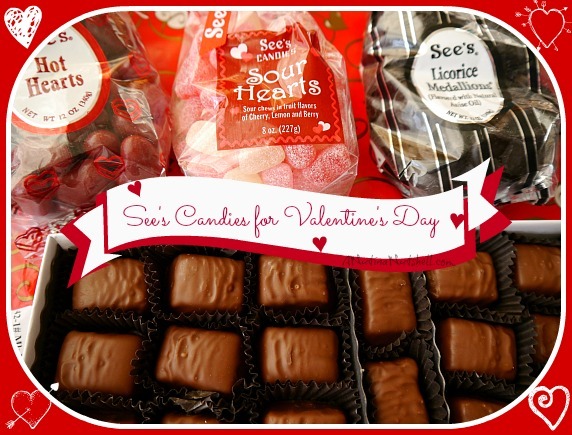 Have you tried See’s Candies before? If so, what’s your favorite item? What should I try next? Samples were provided and did not influence my opinions. Everything I tried was exceptional. I ordered myself a trio of hot gifts from The Swiss Colony, and do you know how fun it was opening that package knowing there were holiday food gift tins inside? 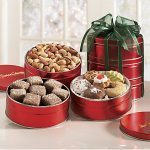 I ordered the Small Tin Trio ($43.95) with traditional Christmas foods like Christmas nuts, cookies, and candy. They were just begging to be tasted! Would the holiday gift food taste as good as it looked on the website? Would it look as pretty? Would the tins really be full? Swiss Colony, you did it! Everything looked beautiful and tasted oh so delectable! 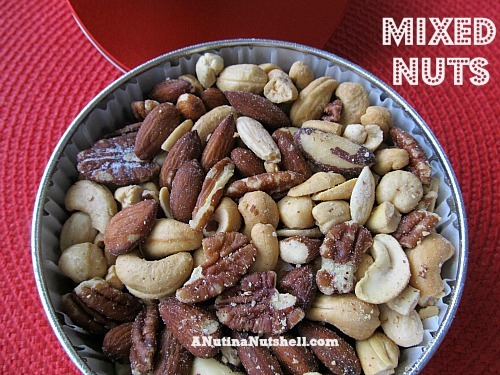 Munching on Christmas nuts has always been a tradition for me, and the fresh and crunchy selection of cashews, almonds, hazelnuts, Brazil nuts, peanuts and pecans fit the bill perfectly. I always bake my own holiday goodies of course, but I can’t make every cookie in the world, so it’s fun to let someone else bake a few varieties for me. 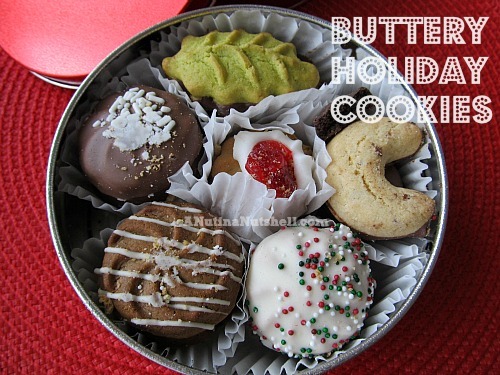 These buttery Christmas treats did a dandy job of making me happy. 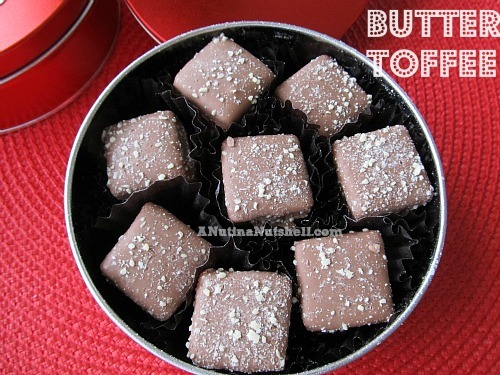 Speaking of making me happy, good heavens was/is this butter toffee delicious! 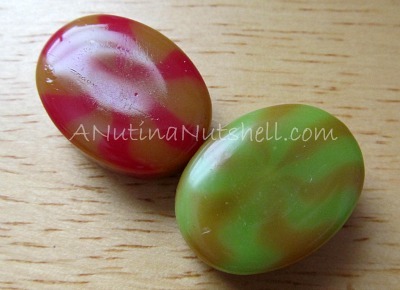 The pieces are good-sized and chunky too. 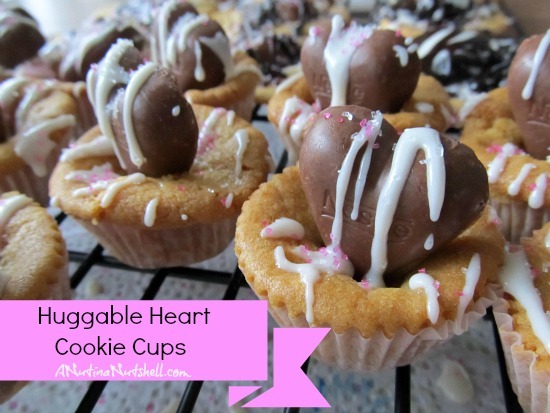 I’ve been storing them in the fridge and savoring them one at a time. 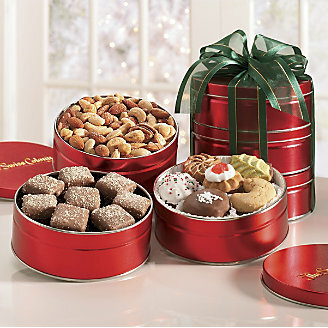 The Small Tin Trio is just one of the many holiday food gift ideas you’ll find at The Swiss Colony. Whether you’d like cheese & meat baskets, truffles, cheesecake, chocolates, or even gluten-free gift ideas, you’ll find them all there. Take a look! 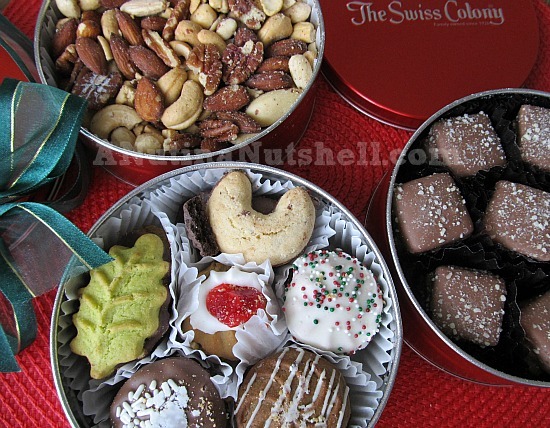 One lucky reader will win the Small Tin Trio from The Swiss Colony! A review sample was provided. All opinions are my own.